WELL v2 Pilot Facilitates The Path towards Health & Wellness — The Green Engineer, Inc.
Health and wellness in the built environment is an escalating focus in the construction industry. Architects are looked to as the experts amongst a project team to provide a space that facilitates a healthier lifestyle and does not negatively impact occupant health during the course of the building’s life. In addition, engineers are modernizing their understanding of the impact ventilation has on occupant cognitive function. Building owners & developers continue to strive for the “best” (within feasible means) for their intended occupants, while recent studies point out that the majority of an owner’s investment is dedicated to the people occupying a project - not the project itself, nor the energy a building consumes. In 2014, the AIA adopted the following mission statement: “The AIA recognizes that building materials impact the environment and human health before, during, and after their use. Knowledge of the life cycle impacts of building materials is integral to improving the craft, science, and art of architecture. The AIA encourages architects to promote transparency in materials’ contents and in their environmental and human health impacts.” However, the field of building for health and wellness has been fraught with an abundance of information, and a shortage in consolidated guidance. The WELL Building Standard developed by Delos, and now operated by the International WELL Building Institute, has served to address this shortage. The launch of WELL version 1 in 2014 has been successful. As of the writing of this article, there are 1,591 WELL projects, both certified and registered, covering 340 million square feet. These WELL projects span 48 different countries. Building off of the lessons of WELL version 1, the team at IWBI has recently released its Pilot program for WELL v2. At first glance, WELL v2 has reorganized aspects of WELL v1 to for more clarity. A new category (“Concept”) has been introduced, focused entirely on Materials. 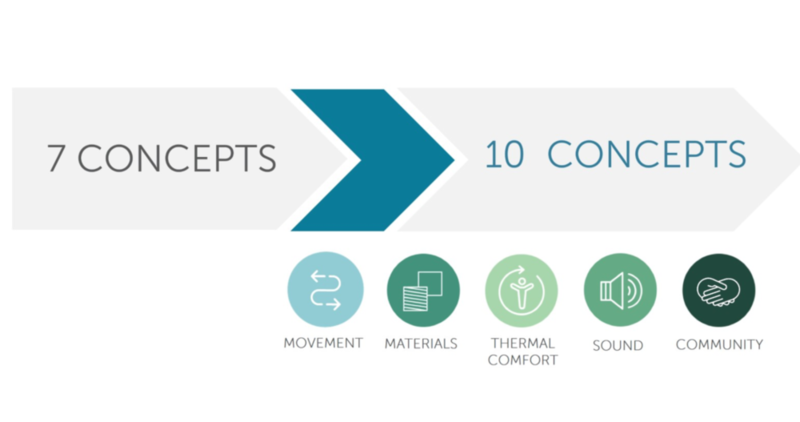 The Materials concept carries elements previously held in WELL v1’s Air category, but it expands on v1’s efforts a great deal, effectively providing a prescription for healthier materials – and thus healthier indoor spaces. Considering the global reach WELL aims for, some project teams may find some of the new requirements challenging. The solution to this challenge, it seems, is WELL v2’s reduction in absolute requirements – called Preconditions – and the implementation of weighted points to achieve certification. Previously, achieving all Preconditions in v1 would earn a project WELL Silver certification. In v2, however, projects must meet all Preconditions and earn additional points. Considering that, now, there are fewer Preconditions, and more than 180 points available, WELL v2 provides a more flexible road to WELL certification than v1. That being said, the point values and allocations can be dizzying in and of themselves. This is (warning: self promotion coming) all the more reason for project teams to engage a WELL Accredited Professional to guide the project through WELL v2 Pilot certification for ease of clarity. WELL v2 has revamped a trademark element of the WELL Building System: Circadian Lighting. Previously, projects pursuing WELL v1 were faced with a new challenge: to understand the impact of their building’s proposed lighting design on the sleep/wake cycles of their occupants. For EMD Serono’s Project SagaMORE in Billerica, MA – the first WELL Gold certified New Construction project in the U.S. (the second in the world) and The Green Engineer’s first WELL certified project – the quest to meet the Precondition for circadian lighting was both challenging and costly. The team had to retrofit an existing portion of the project’s lighting in order to comply. In v2, WELL has been adjusted to appropriately account for the role of daylighting in occupant sleep/wake cycles – which means compliance is no longer required purely through electric ambient lighting. Projects in v2 can now demonstrate compliance through the provision of sufficient glazing per floor area in lieu of meeting circadian lighting levels. In addition, an Optimization has been introduced to reward projects for installing tunable lighting – lighting that changes in color temperature to facilitate human sleep/wake cycles (similar to the “night shift” option on smartphones and computer screens). WELL v2 also brings considerable cost savings to potential projects. One consistent criticism of WELL v1 was the substantial (albeit warranted) cost for the program’s support, and for performance verification testing. In a recent estimate prepared for 1 million square feet of core & shell space spanning two buildings, the project would save approximately $70,000 by pursuing WELL v2 instead of v1. 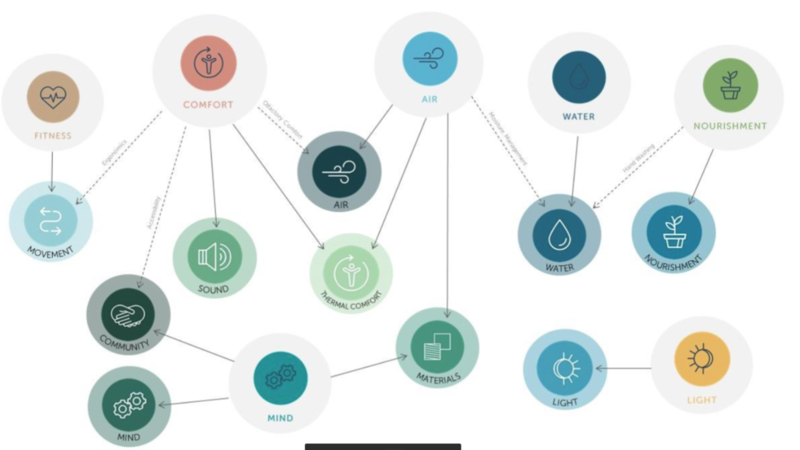 V2 accomplishes this by shifting some of the on-going monitoring of air and water quality, and thermal comfort parameters to the owner. If this core & shell project were to pursue WELL v2, then it would pursue WELL certification under the new WELL Core system – which is essentially WELL v2 with a lower certification level of “Certified” at 40 points. For projects considering WELL, it’s typical that preliminary air, water, and noise assessments are done at the project site. WELL v2 has introduced a few minor additions to air and water quality parameters. Be sure to specify WELL v2 (not just WELL) to any service provider in a request for proposal. WELL v2 has added Nitrogen Dioxide thresholds for the enhanced air quality Optimization, and Cadmium and Chromium in the water quality Precondition for dissolved metals. WELL v2 has apparently dropped WELL v1 thresholds for polychlorinated biphenyl and glyphosate in water quality, but addresses polychlorinated biphenyl in a Materials Precondition for hazardous material abatement. Some referenced standards have changed from WELL v1 to WELL v2. Product VOC emissions testing must now be conducted and certified according to California Department of Public Health’s Standard Testing Method v1.2-2013 – which reflects a halved Recommended Exposure Level for Benzene. Ventilation standards in the WELL v2 Pilot must meet ASHRAE 62.1-2010, despite WELL v1 requiring compliance with ASHRAE 62.1-2013. Testing and balancing of HVAC systems must be conducted according to ASHRAE 111. Reviewing the WELL v2 Pilot program has left me impressed with the steps IWBI has taken in attempting to address some of the pressing issues in our culture today through facility operations and owner policies. New Optimizations address occupant education to recognize and properly react to signs of mental distress – to name one of a slew of educational components. Projects can earn points by developing an emergency/crisis preparedness plan and promoting emergency resources like AEDs. Likewise for having opioid emergency response kits and training if fitting for a project. Projects are rewarded for policies that subsidize or provide no-cost sanitary pads and/or tampons in women’s restrooms in the Optimization named, “Provide Essential Accommodations” - effectively attempting to combat the dubbed “pink tax” on femininity. The list of potential progress spelled out by the WELL v2 Pilot standard goes on, but I’m maxed out on being impressed. By Michael Munn, LEED AP, WELL AP, CPHC, Project Manager at The Green Engineer.